Buy a pub cellar water leak dtection package and prevent your valuable stock from being destroyed without you knowing about it. 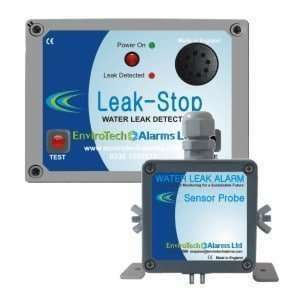 The kit includes the LeakStop alarm panel, 10m of connection cable and a water leak detection sensor probe. 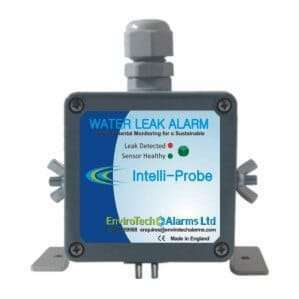 Buy a pub cellar water leak detection kit and protect your stock from becoming damaged due to flooding. Designed around a water leak detection sensor probe, any presence of water in areas where it is not expected will trigger the alarm. Everything required for the detection of water comes in this package including the alarm panel, the sensor probe and the cable to connect them. Have the piece of mind that should a pipe burst or the condensate tray from your A/C unit spill over into your cellar, you’ll be alerted to it immediately. The LeakStop alarm panel can be mounted in an area away from the cellar where it will be seen and heard in the event of a leak. Knowing that a leak has occured enables you to take quick and evasive action to minimise the damage and incurred cost associated with this event. 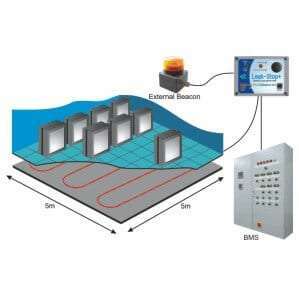 Single zone water leak detection alarm panel with connection for solenoid valve and a volt free relay for connection to an external device such as a text dialler or beacon. A water leak detection sensor probe designed to be installed in harse environments where the potential for damage is elevated. Comes with height adjustable brackets that enable you to set the hieght anywhere between 1mm to 25mm from the floor. Setting the sensor at the appropriate height takes into account floor mopping which could trigger a false alarm. Kit includes 10 metre connection cable to connect sensor probe to the alarm panel.